Innovation abounds in the PV industry. 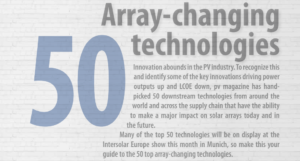 To recognize this and identify some of the key innovations driving power outputs up and LCOE down, pv magazine has handpicked 50 downstream technologies from around the world and across the supply chain that have the ability to make a major impact on solar arrays today and in the future. Many of the top 50 technologies will be on display at the Intersolar Europe show this month in Munich, so make this your guide to the 50 top array-changing technologies. 7th place for A+ Sun Systems – SunNet Roof mounting system. A+ Sun Systems’ steel cable-based mounting system enables roof mounting where weight is an issue, by supporting the net from parapet walls. Adaptable to an arched roof, a steep slope or even vertical mounting, the system is a streamlined fix for challenged sites. The company, based in Italy, says a 1 kW system can be installed by one worker in 50 minutes. No ballast is used, although the net utilizes non-penetrating easels in central spots to keep the system raised. The A+ Sun Systems cable-based system is able to sustain strong winds while at the same time adding very little weight to the roof. The A+ Sun Systems’ ground mounted system, the SunNet Ground, can be used on flat and pitched ground, with a slope of up to 50°. The array-changer: Light, flexible and with quick installation, A+ Sun Systems’ approach can deliver flexibility and real advantages. On the downside, it’s a long way from being a standard technology.